Here is an endorsement in a local court race. And meanwhile, here is an interesting blog from East Greenbush. Now, I was in Brooklyn last night. I saw people waiting in line for gas. In Brooklyn, you have Black, White, Hispanic, Asian, Jewish, Muslim, Christian, Secular, college-educated, high school drop outs, rich, poor, native born, foreign born, and yet Obama will probably carry Kings County with about 85% of the vote. There is probably some rural, southern county, plus somewhere in Utah, where Romney will carry the county with 75% of the vote (but not 85%). The difference is that the Republican county will be all white, rural, all Christian, less than average percentage of college educated, etc. The Democrats are failing to reach one piece of the electorate. The Republicans are failing to reach many parts of the electorate. If the Republicans cannot get some kind of divide and conquer thing going on in a place as diverse, with as little common ground, as Brooklyn, they are doing something very wrong. You can't write off this broad a swath of the population. Meanwhile, of a different topic, whenever I hear local politicians discuss any issue, any issue at all, Democrat or Republican, I think: kabuki theater. I can imagine a sincere conservative speaking to a board of elected officials, talking about high taxes or something, then a sincere liberal talking about the environment of something, and I just imagine the internal dialogue in the head of the normal elected official in New York: "I can't wait until this naive peasant stops talking so we can do what we always do." The Democrats go around talking about some issue, then the Republican talk about another issue, and then you find some paper that one gang or the other is stealing. Silence. 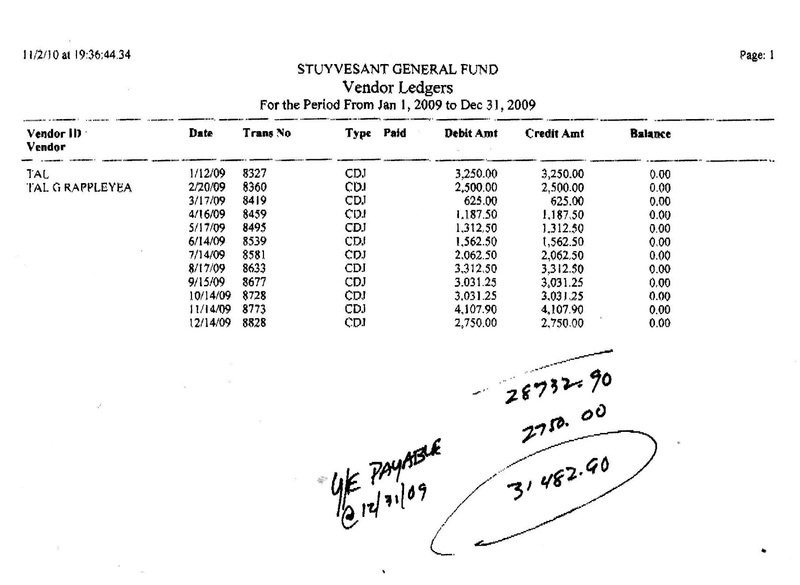 More to the point, the bookkeeper in the Stockport case, the missing $250,000, is also the bookkeeper in Stuyvesant. 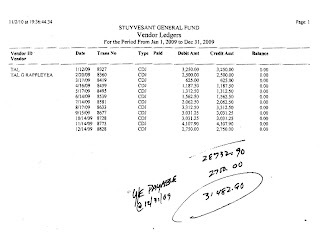 While the fact that Stuyvesant Town Attorney Tal G. Rappleyea was part of a gang that stole more than a million dollars from Columbia County over several years should not mean we forget that he also stole $10,000 from Stuyvesant in 2009. Other members of the gang include Robert Fitzsimmons of Fitzsimmon, Mack and Mills, Andrew Howard of Freeman Howard and a few others. Here is Tal's incoherent explanation. 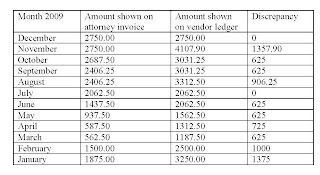 Here we have a linked between the missing $250,000 in Stockport, to the missing $10,000 in Stuyvesant to the missing 1.5 million in Columbia County through Rappleyea, Fitzgerald, Fitzsimmons, etc. 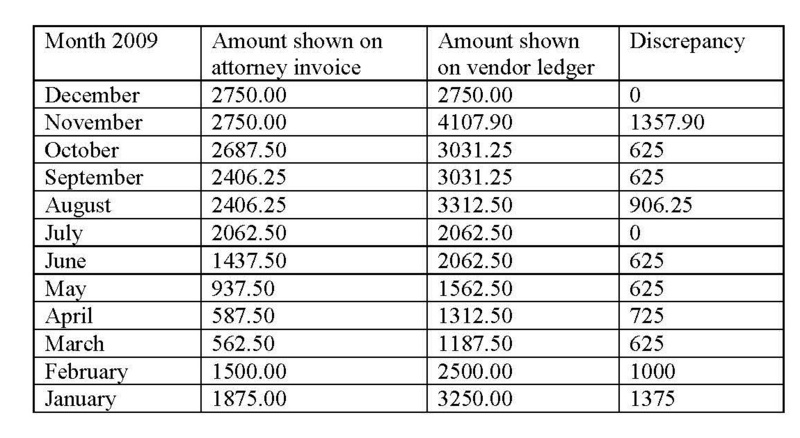 Oh, and about $500,000 in assessment fraud, tangentially related. Same gang. Republican gang. Any Democrats care to complain? No. Why? They are doing the same crap here and other places. Everywhere I looked, I found problems.